Beautiful 5 bedroom holiday home to comfortably sleep up to 12 near Cap-Ferret, Aquitaine. Ideal for a family holiday, this self catering home offers a wonderful private pool area with sun loungers and is only a short walk or drive away from the blissful Mediterranean beaches and has everything to make your holiday unforgettable! On site parking. Cot available. Airport within 1 hour. Pets not accepted. 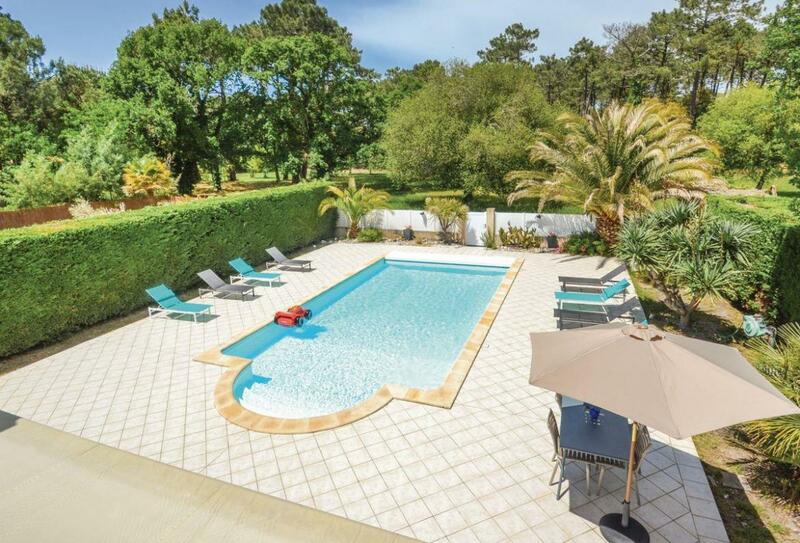 Set between the ocean and the Arcachon Basin yet within walking distance of both, this splendid modern property is situated in a quiet residential area close to the village shops, cafés and restaurants. Beautifully light and airy, it is well equipped and comfortable, and enjoys its own private swimming pool and pretty lawned gardens. The beautiful Atlantic Coast provides wonderful surfing and offers miles of sandy beaches, while younger children will enjoy the quieter waters of the Bassin, collecting shells at low tide. Behind the house the pine forest offers a huge network of cycling paths and tennis, riding, sailing and fishing can all be enjoyed locally. There are ferries to Arcachon and the jetties are busy with boats providing trips to the bird island in the Bassin. An ideal spot to discover the Dune de Pyla (the highest sand dune in Europe), the Médoc Region is also worth a visit for its famous Bordeaux wines and vineyards, with tasting tours available. Location: 800m to village (shops, cafés, restaurant), 300m to beach on the Arcachon Basin, 3.5km to sea beach (on foot), ferries and boat trips from Cap Ferret (4km), 1km to tennis, 60km W of Bordeaux (shopping, large town).